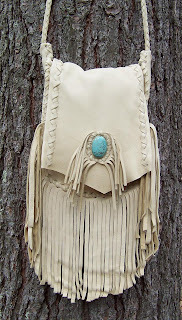 Ounce for ounce, few commonly used leathers can match the tensile properties of deerhide. It's supple, yet surprisingly strong. 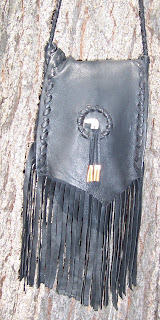 Used for garments and bags; a well-made deerhide item will last for years and gain character as it ages. I begin by laying out my own original patterns, taking the direction of the grain into consideration for each individual piece. I use a white upholstery pencil to mark them out -- it rubs off easily after I've cut the pieces. 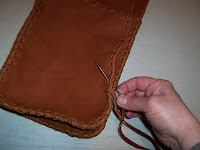 I use simple hand tools -- I cut the gusset with my trusty metal straightedge and a rotary cutter; all other pieces and laces are scissor-cut with a sharp pair of leather shears. Every hole is punched with a drive-punch and mallet -- when you punch as many holes as I do, a squeeze-punch is not your friend! 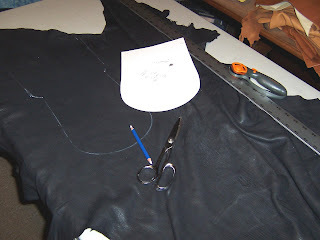 Every step is done by hand -- each seam is stitched twice, once in each direction. This gives a good-looking v-stitch that is strong and stable. 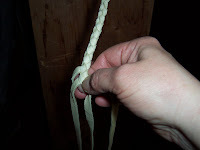 I use round-braid straps on most of my bags for the same reasons -- looks good, very strong. A lot of love goes into each bag, and they are all unique creations. 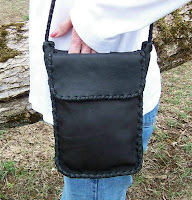 It gives me great satisfaction to create something that is both durable and attractive. Here are a few, all done and looking great! They are soft and sumptuous and feel every bit as good as they look! 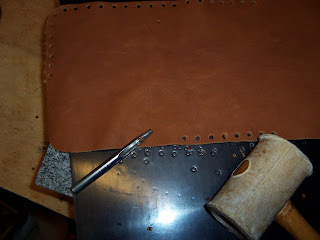 Deerhide is surprisingly easy to clean -- it's a very friendly and reliable leather! These can be viewed in my Etsy shop, linked at the top on the left. 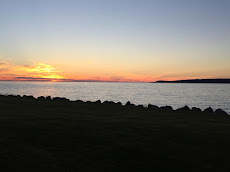 Springtime is a busy time for me, but every once in awhile I need to take time off the commerce angle of the craft and do something just for the fun of it. 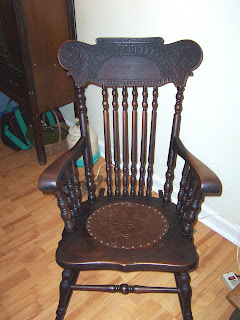 A friend of mine picked up this awesome antique rocking chair; it needed some good furniture oil, but otherwise was in great shape except for the old brittle leather seat. Though she liked the design on the old one, she wanted something different. Like several of my good friends, she has an affinity for turtles. 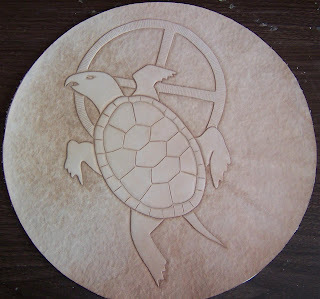 This design comes from a painting another friend of mine did for me years ago. The artist's name is David Dutcher, and I wouldn't want to fail to give him credit! 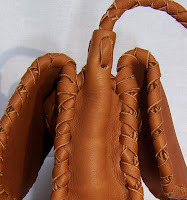 Looks pretty good carved into leather, doesn't it? 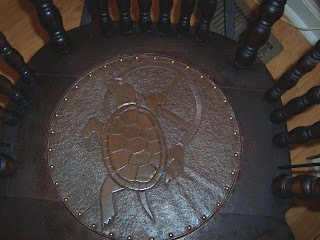 After dying it dark brown to match the chair, I gave it to my friend to install. 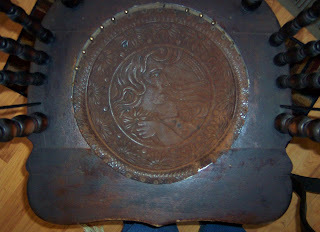 She used new brass tacks that matched the old ones in size and shape. Time is scuttling past and Spring is on the horizon. My snow is melting fast and the crocuses are actually blooming! 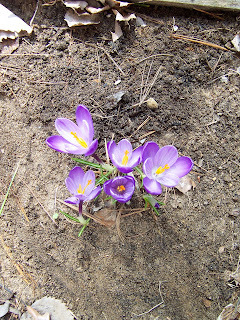 Northern Michigan has had a rigorous winter this year -- lots of snow, bitter temperatures -- these small flowers greet me like a promise! Spring fever is upon me. I'm spending today in my yard! I sure hope it's nice where you are.